Address Atlantis, The Palm, The Palm Jumeirah, Dubai, U.A.E. Collection Information Tickets can be redeemed at the Lost Chambers Ticketing Plaza. The legend of Atlantis truly comes alive amidst the intriguing passageways and tunnels of The Lost Chambers Aquarium. With over 20 marine exhibits to explore, containing over 65,000 aquatic animals, including Piranha, Giant Arapaima, Jellyfish and many more, Atlantis is home to the largest open-air marine habitat in the Middle East. The Ambassador Lagoon provides a window into the ruins of the ancient city of Atlantis, mesmerising guests with a stunning display of aquatic life gracefully gliding through the relics of this long-lost civilisation. Through The Lost Chambers Aquarium, the fascinating myth becomes a spectacular reality where guests can experience a true sense of wonder at a remarkable underwater world. A fantastic environment for a family day out, school trip or special event. At Lost Chambers & Ambassador Lagoon Atlantis there is adventure and education is equal measure: not only can you spend the day away watching the untold number of sea creatures and fish, but in the many chambers, you’ll learn about the history of Atlantis, that has been lost for thousands of years. Find your way through the mazes that lay beneath the water in the tunnels of this mythical civilization as you and your travel companions continue your underwater journey. For added fun, there are interactive aquatheatre shows, marine life education, educational touch screens, and feeding shows. No matter how old you are, at Lost Chambers & Ambassador Lagoon Atlantis you’ll have as much fun as the kids! The interactive Aquatheatre show includes many facts about the marine life and scuba diving, it is then followed by a feeding show. The shows are offered daily at 10:30 AM and 3:30 PM. 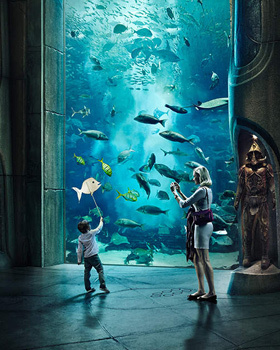 All visitors can enjoy the experience of the Lost Chambers & Ambassador Lagoon Atlantis as there are no age restrictions to enter the aquarium. All children under 12 years old must be accompanied by a responsible adult (18 years and above). One adult can only accompany up to three children. Be sure to enquire about the time of the shows, attractions, and experiences that are included with this entry pass! Lost Chambers & Ambassador Lagoon Atlantis is located outside Downtown Dubai. The aquarium is located on Atlantis the Palm which is about a 32-minute drive or a taxi ride from the centre of Dubai. If you are looking to use public transportation, you can expect a 20-minute ride to the Mall of Emirates. Once arriving at the mall, you can then take a 20-minute taxi ride to the gates of The Palm.